In late 2018 Rosetta Stone won the prestigious Tabby Award for Mobile Innovation for the second year in a row! 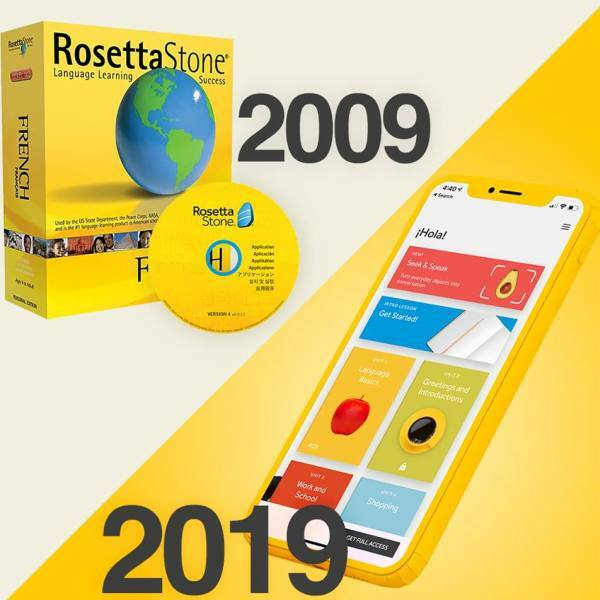 It’s a testament to how much Rosetta Stone has changed – #10yearchallenge – from a time when the business was still dominated by CD ROM sales. The pace of innovation is set to get even faster in 2019 with a whole raft of new features and services due to be launched on the app. The Tabby Awards 2018 once again recognised the market-leading performance of the Rosetta Stone App, awarding it the prestigious Award for Mobile Innovation in the Education category for both Android and iOS. The awards are made based on customer reviews on the apple and google stores, as well as an assessment of technological achievements and compatibility. Rosetta Stone was doing Augmented Reality before anyone invented the term and it’s only right that the company should be amongst the very first to bring the latest AR tech to language learning. From early this year, iPhone X users will be able to create their own Rosetta Stone lessons by pointing their camera at objects that will then be described in the learnt language! It’s the future of immersive learning and – once again – Rosetta Stone is right at the forefront of this development. 2019 sees the introduction of personal learning plans for app users (already live on Android) where every customer will be given a learning plan based on their interests and abilities. Rosetta Stone customers love to learn intuitively and work out meanings from themselves – that’s why they choose the app in the first place. However, many have also said that sometimes it’d be great to have a back-up: some more text-book style features to support the immersive learning process. So without diluting the immersive experience there have been several developments to allow customers to get extra information if they need it. First came ‘Phrasebook’ where common phrases can be quickly looked up, next was Translations that now provide a ‘look-up’ option on the latest version of the app. Soon ‘Grammar Guides’ will appear as well, helping customers understand the grammar rules they are being exposed to in the main lessons. #10yearschallenge is only part of the story for Rosetta Stone. Founded in 1992, the company led the way in realising the power of home computing for language learning. The first to market by decades, the company never rested on its laurels. For over a quarter of a century the original concept has been tweaked and developed, adding features and building the huge resource of learning that is accessible to learners today. Where do you want to be in 10 years time? It’s plenty of time to become fluent in another language, but only if you make a start ! – Get going the enjoyable way and start with Rosetta Stone today. The 10 year challenge offer is available only online, but it gives you access to the innovative app as well.